The powerful and compact design of the USA manufactured VersaLift™ boasts extremely high lifting values in comparison to its lightweight design and presents well in a sleek, industrial grade, stainless steel housing. The VersaLift™ can be used on flat or round non- flexing steel in a horizontal lifting orientation and has a built-in, lift capacity "test" function, which essentially devalues its own holding value and assists the user in determining whether or not a load is safe to lift. If the load can be successfully lifted a few inches while in the "Test" mode, the user can be assured that the load can be safely lifted in the "On" mode. Another great feature of the VersaLift™ is the bolt- on lift bracket for vertical lifting of flat steel (pictured above). This optional bracket allows the user to lift a flat part in vertical orientation - without the need of an extra piece of equipment, such as a vertical lift adapter. Also worth noting is the lift magnet’s RFID(Radio Frequency Identification) chip, which alerts the user as to when scheduled lift calibration is due and records any maintenance that was performed on the product. 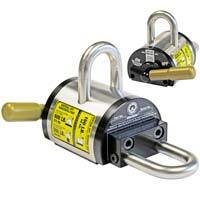 For more information on the VersaLift™ lift magnet, contact IMI’s product specialists at 800.662.4638.